Please help spread the word about this event by sharing this page with those you know on social media - be they family, friends, neighbors, co-workers or anyone you think might like to attend. You can also help us by downloading the event flyer and posting it wherever allowable - such as stores, local businesses, libraries, faith communities - anywhere you think it would bring attention to this important issue and event. 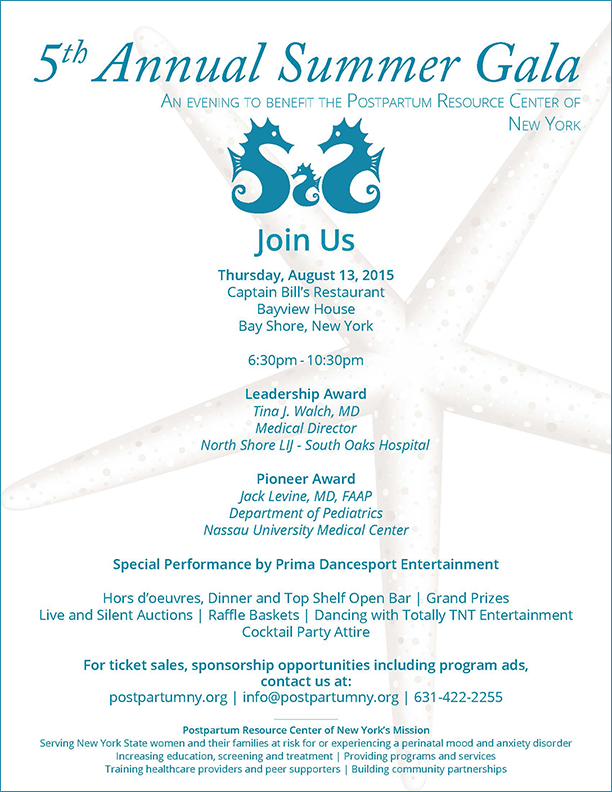 The flyer is available in two formats: 5th Annual Summer Gala (pdf) and 5th Annual Summer Gala (png). Looking for information on Summer Gala 2016? You may have joined us in the past at the Summer Gala, now instead join us for this charity event at the Comedy Fundraiser Night on August 11, 2016. Please click here to reach the event page. Sponsorships: Thank you to our 5th Annual Summer Gala Sponsors! To be a sponsor of future events, please contact us by email here or by phone here. Thank you to our Benefactor Event Sponsor Carol Lane Photography for the wonderful work and coverage of our 5th Annual Summer Gala! We love working with Carol Lane and so greatly appreciate all of her generous support! To see this this year's photos and to purchase prints, please visit Carol Lane Photography's website here. A key beneficiary of this event is the Postpartum Resource Center of New York’s Vision – Project 62™ – Building a Perinatal Mental Wellness Parent Support Network and Safety Net in every New York State community. To learn more, get involved and be a sponsor, please contact us here. Your help is needed now to save lives, and build healthy families for vibrant New York communities now and for future generations. Click here to donate and join our 2015 Scroll of Honor today! Thank you for your support. please visit the website of our event photographer, Carol Lane.